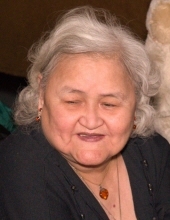 Lifelong Alaska Native and Nikiski resident Virginia F. Trenton, 78, passed away Sunday, Mar. 10, 2019 at St. Elias Specialty Hospital in Anchorage. A panikhida service will be 12 noon Monday, Mar. 18, at Peninsula Memorial Chapel in Kenai. Funeral services will be 1 p.m. Monday at Holy Assumption Russian Orthodox Church in Kenai. Burial will follow the service at the Monfor Cemetery. Archpriest Daniel Charles will officiate. A potluck will follow the burial at Tyotka’s Elder Center. Pallbearers will be Duane Reitter, David Kroto, Justin Trenton, David Pringle, Brandon Kroto, and Shon O’Brien. Honorary pallbearers will be Eugene, Roy and Freddy Trenton, Ted Kroto, and Brian and Kevin Trenton. Virginia was born Nov. 24, 1940 in Kenai. She graduated from high school and went to nursing school. She lived in Tyonek from 1968-88 and Nikiski from 1988 until her passing. She worked for the Native Village of Tyonek, the Dena’ina Clinic and the Kenaitze Indian Tribe. She was a member of the church and was also CIRI Elder Shareholder of the Year in 2011. Virginia enjoyed crocheting, watching game shows, and spending time with family. Virginia was preceded in death by her husband, David, daughter, BK, grandsons, Ted and Adam, granddaughter, Anastasia, and 11 siblings. She is survived by her sons, Roy Trenton, Eugene Trenton and Harry “Freddy” Trenton; daughter, Julie Murray, all of Nikiski; son-in-law, Ted Kroto, Sr.; grandchildren, Rachel Toney and husband, James, Sara Murray, Sherrie Reitter and husband, Duane, Adrianna Trenton, and Marjorie Trenton, all of Nikiski, Dyann Wik of Ohio, Ivory Trenton of Nikiski, Justin Trenton of Tyonek, David Kroto and wife, Marie, and Vanessa Pringle and husband, David, all of Wasilla; great-grandkids, Rain, Aaron, Aurora, Adam, Paige, Daniel, Brandon and Lillian Kroto, Katherine Velzor, Joyce, Lalaith, Anastasia, Isaiah and Rachel Trenton, Juliet Reitter and Edgar and Henry Toney; plus many other extended family members. Memorial donations may be sent to Adrianna Trenton, P.O. Box 8658, Nikiski, AK 99635. "Email Address" would like to share the life celebration of Virginia Fiocla Trenton. Click on the "link" to go to share a favorite memory or leave a condolence message for the family.